Trading Spaces always have two types of portable buildings available that are ideal for the building industry. The first is a 6.7 metre x 2.8 metre (22ft x 9ft) portable office and store, which is divided between office and storage space. This cabin is ideal for a builder that needs a small site office and a very secure storage unit, and it costs less than having two separate units. We also provide another type of portable building that’s ideal for a building site with limited space where the builder still needs a full sized office and good storage. This unit consists of a 20ft x 8 ft (6.1mt x 2.4mt) steel storage container. 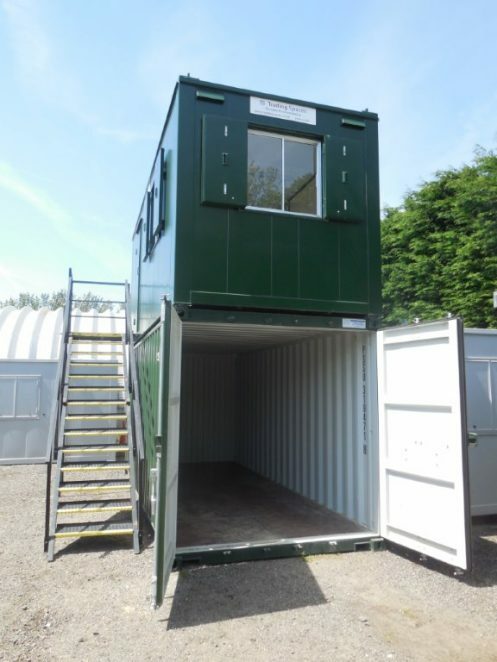 The final option is a specially built anti-vandal steel office (complete with lighting, heating and electrics) that stacks perfectly on top of a storage container. Access is then provided to the portable office on top by way of a staircase at the side. This is an ideal solution for building sites where there is limited space but a larger secure storage area and a vandal proof office is required. Very few providers of portable storage and office solutions offer this combination of portable office and storage container for the construction industry, so if you would like further details please don’t hesitate to contact us on 01206 215505.